It was only recently in April that I started using Lightroom to edit my blog photos. As super happy as I am to finally be able to use Lightroom, I could not be more grateful for VSCO — the iPhone version, that is, so we'll call it VSCO Cam — as it was what I use to edit ALL my blog photos for three freakin' years. 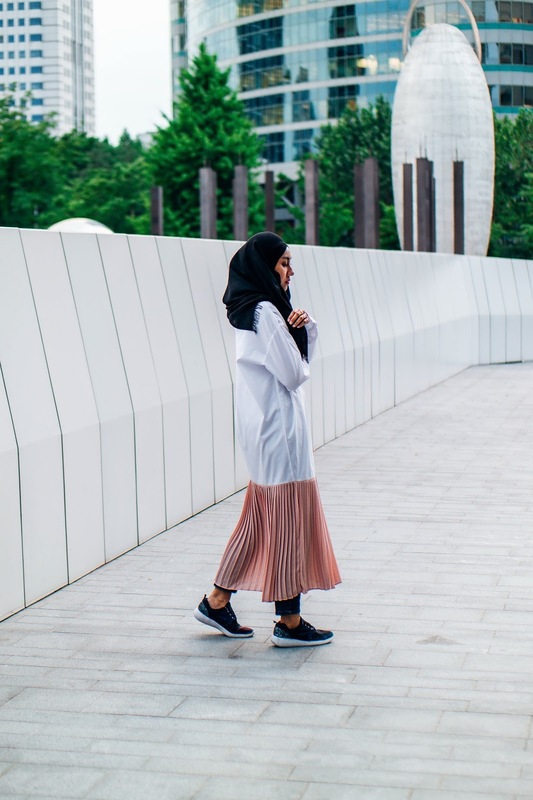 So if you are looking for ways to improve your blog photo editing without the help of Photoshop or Lightroom, continue reading to find out how to edit your blog photos with just the help of VSCO. Note: I know that some of you are already VSCO Cam-pro but just in case, I'm going to try go step by step, so you should probably get a snack or something as this is going to be a longgg post. First of all, obvs, download the VSCO Cam app; I edited most of my photos on my iPad but the app is definitely on my iPhone too. There are plenty of free presets already available but I purchased some others because, well, OPTIONS, guys. They aren't pricey and worth the money in my opinion. Tip: Google examples of the different filters before you decide which group of presets to buy. Play around with the different presets to decide which are more your "vibe" and highlight them (VSCO now lets you "star" your faves). Be aware that some filters do distort the colours, so think about what your priorities in editing are. My personal favourite filters were: A8/Analog, NikeLab ACG (ACG), C4/Chromatic, HB2/HYPEBEAST, LV1/Levi's, Q5/Alchemy, S3/Clean, and SE3/Street Etiquette. In this post I will be showing you the steps I took to get from the left "Before" photo above to the "After" photo on the right. 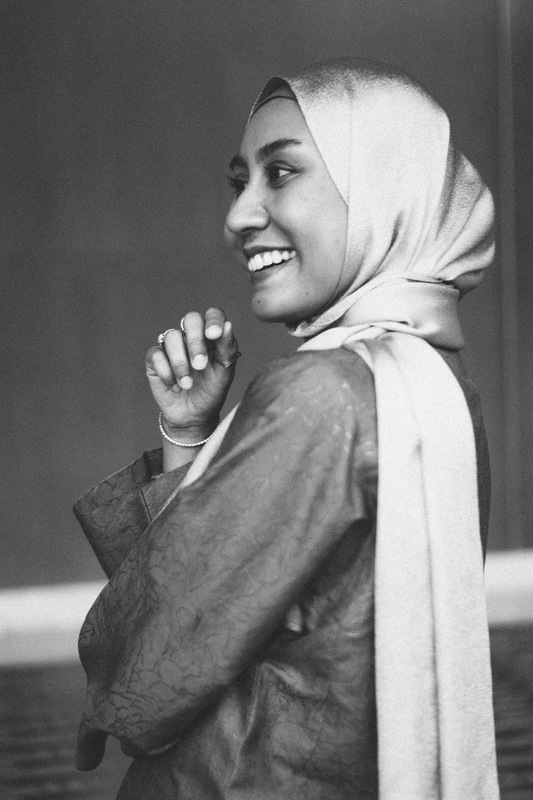 1) Transfer your blog photo into VSCO Cam. Test out your favourite filters on it (at the highest intensity of 12) in a spot of good neutral lighting and decide which filter's style suits the photo to your liking the most. My top three filters were S3, HB2, and Q5 so I always ended up using them. Another tip: I find that S3 naturally enhances the colours in any photo so I would usually set S3 on low intensity (below 5) on a photo, save it, upload that into VSCO and then layer a different filter on top of it! (N1/New Modern is another good option for layering, but I prefer S3.) But for today we'll concentrate on one layer of filter. 2) I'm going with HB2 for this photo. Usually I didn't go all the way to the maximum +12 intensity for any filter, so I'll set HB2 at intensity +9.0. Then change to editing mode from the filter options and Sharpen the photo to +7.0. It's already looking good, and honestly you can even leave it as is at this point! But I like to tinkle about, so I'm not going to stop here. FYI, it is TOTALLY up to you what intensity you want to put for each editing step! 3) I like to add definition by upping the Contrast, so let's do a +1.0 there. At this point it's looking a little too bright, especially the bright area on my face, so I'll decrease the Exposure by -1.0. Some people like their photos to be super bright so it's fine if you don't want to touch the Exposure button at all. 4) The photo looks a tad too warm for me so I make it more cool by decreasing the Temperature to -0.5. I still don't like the general yellow hue of the photo, so I compensate that by doing a +1.0 to Tint to get rid of some of the yellow. The Skin Tone in VSCO Cam can also be used to change the tone of the photo so do play around with both Skin Tone and Tint! 5) You can consider the photo done and dusted at this point but I think a slight fading can look good on some photos, so I'm just going to go ahead and increase the Fade to +1.0. I almost forgot about one of the most useful editing tricks you can do using the app: if you think the colours look too flat, adjust the Saturation! I'm increasing it to +1.0 for this photo. 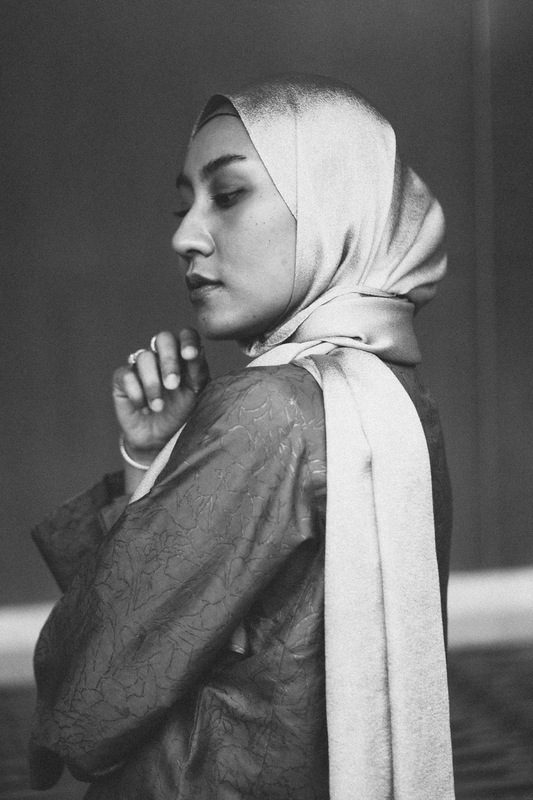 Anddd that is the finished VSCO Cam product! The VSCO app was technically not the only tool for my editing: I turn to ACDSee to straighten any photo and for cropping even though VSCO is able to do both. I do like the Repair Tool in ACDSee for getting rid of any weird speck on my clothes or face (that includes unsightly zits that I know for sure won't linger forever so it's not considered cheating, guys!). 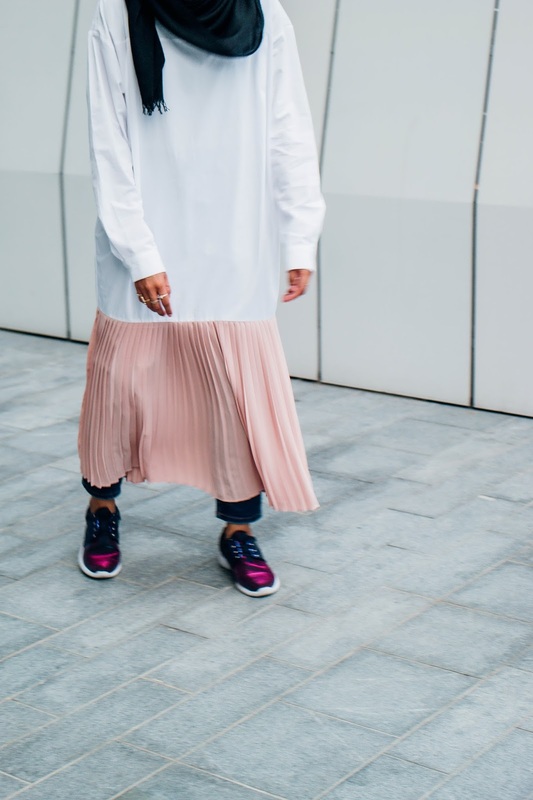 If you're a regular reader of Affordorable, you might remember this photo from my Xintiandi, Shanghai outfit post back in April; it was one of the first blog posts I edited using Lightroom. To be honest I wasn't entirely satisfied with the result of the edited photos in that post. I found Lightroom a little tricky to learn at first, but I think I've got a better hang of it now — I'm currently loving the photos of my latest posts that were edited using Lightroom. I'm pretty sure if I were to re-edit the Xintiandi pics using Lightroom again I would do a better job! I'm going to concentrate on future posts however, but in the meantime you can compare this final product of VSCO Cam with the (amateur) Lightroom editing in my Army Green & Mickey outfit post. Which photo editing style do you like better? As someone who's already using Lightroom, I don't think I would go back to using VSCO but I also think it is really an amazing app to help improve anyone's photography, blogger or not. It's a must-have sufficient tool for any blogger (and Instagrammer! ), especially a newbie. 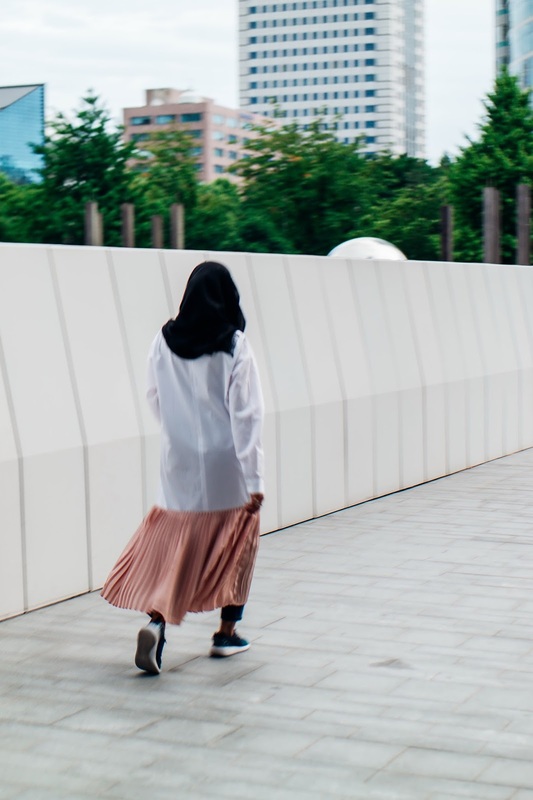 The editing options in VSCO Cam are practically endless so it's easy to customise something that is really your own, even if you and a bunch (or hundreds / thousands) of others like the exact same filter. Do you use VSCO Cam app? How do you approach editing when using it? How different is your editing method to mine? 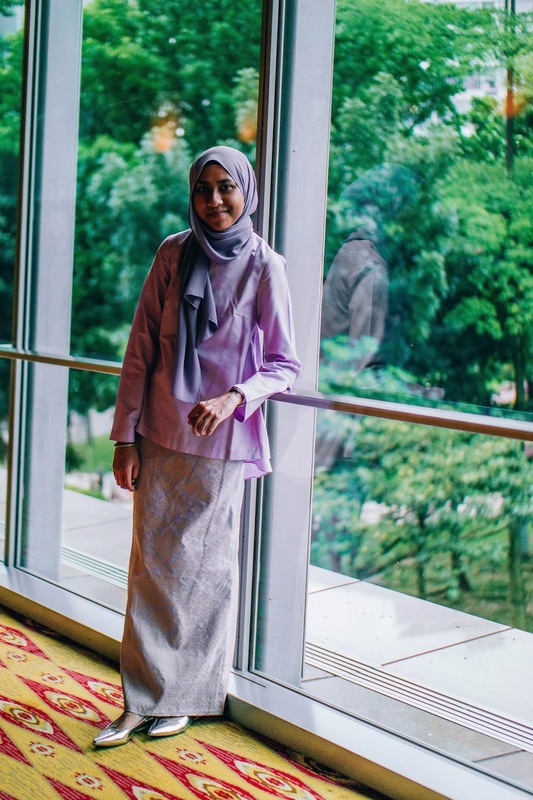 Rina's outfit here is very much reminiscent of my green and gold Eid outfit last year, and there is a reason for that: she borrowed that green top to bring to our tailor and said she wants to turn the 2-metre lavender hued material she had into something similar to my top. 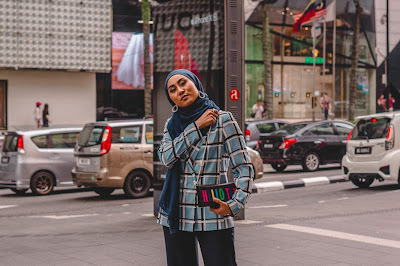 The bottom part of Rina's outfit is made of a fabric that resembles a type of brocade that's long been a part of Malaysia's textile history called songket, which is also popular in other countries like Indonesia and Brunei. 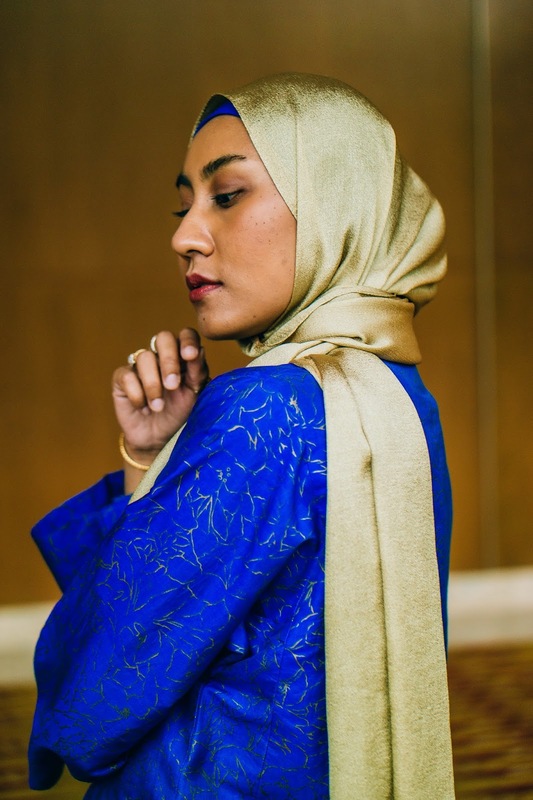 High-quality songket is hand-woven and could cost thousands; I know people who have bought up to RM 15k worth of songket fabric to turn into their one wedding outfit! 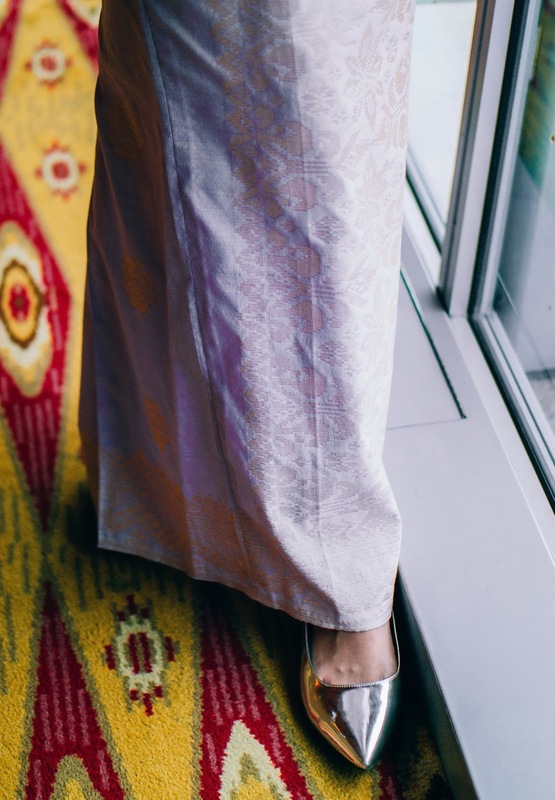 I myself wore white songket on my wedding day but the ones that are "machine-made" can be very affordable, and can be just as pretty as the handmade ones — although nowhere near as exquisite, admittedly. 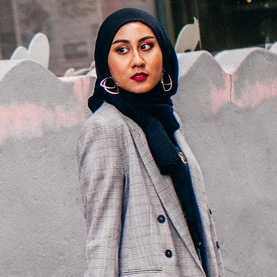 I have actually borrowed the periwinkle scarf Rina wore here to pair with this pinstripes on pinstripes outfit — and I even borrowed her usual hijab style, but why not? 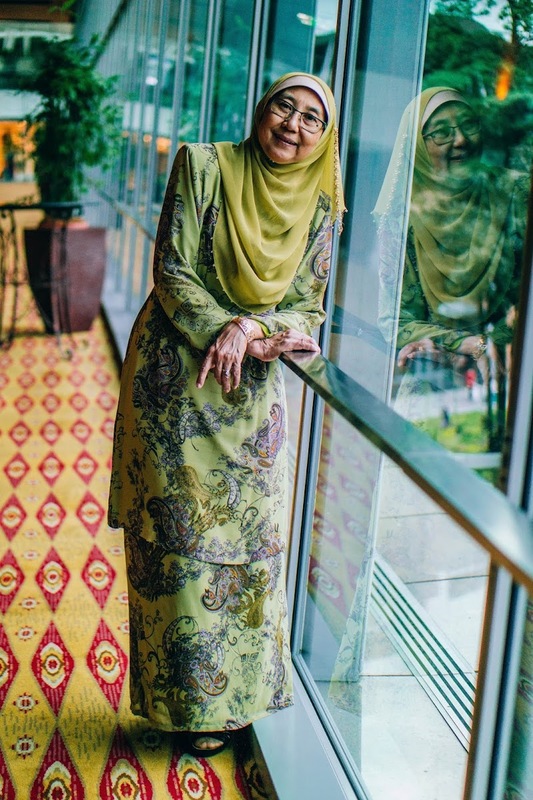 In case you're not from this side of the world, "Mak" is what I call my mommeeyh! 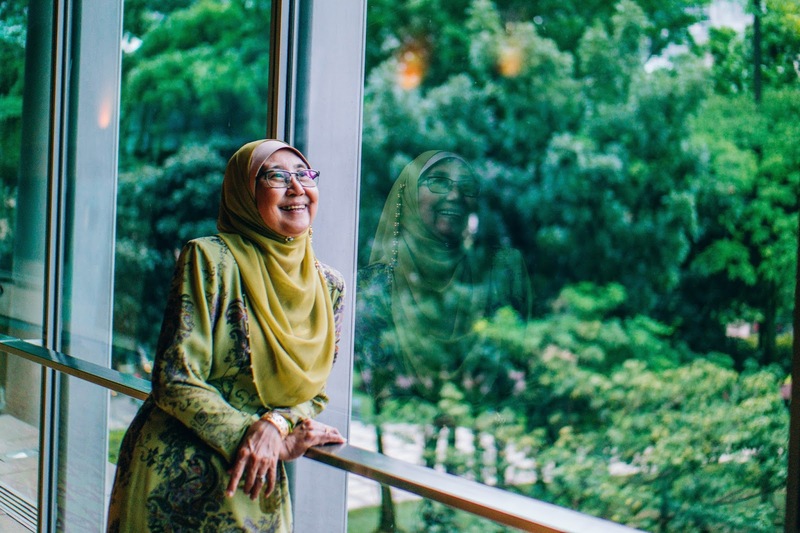 My mom, my little sister, and I went to an open house together with Shah after which I took the opportunity to not only photograph the traditional baju kurung I had on but also my mom and my sister Rina's outfits of the day. 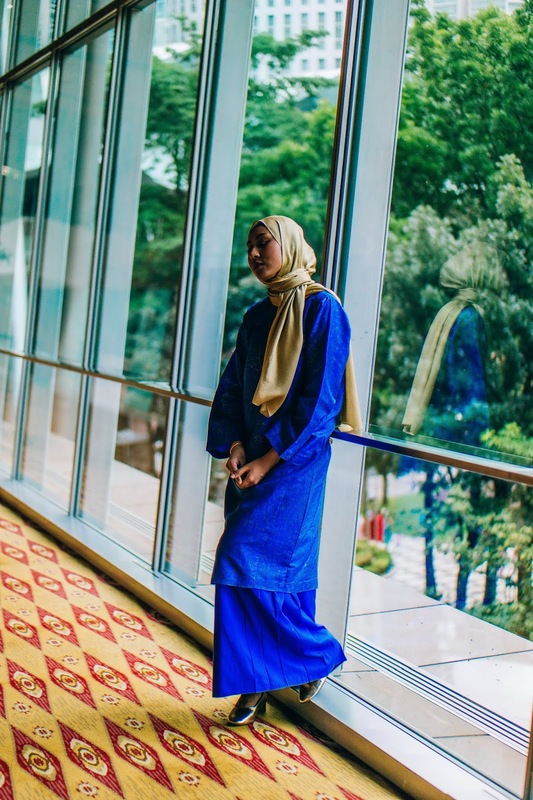 Note: "Open house" is what we call those Eid events where the host invites people over and these people basically just mingle about and most importantly EAT delicious Eid food that Malaysians love. Also the word "house" is used loosely in this term; we went to a hall on this particular day that was "open" from 2:30-6:30pm filled with thousands of people at a time with the yummiest selection of food, mmm. 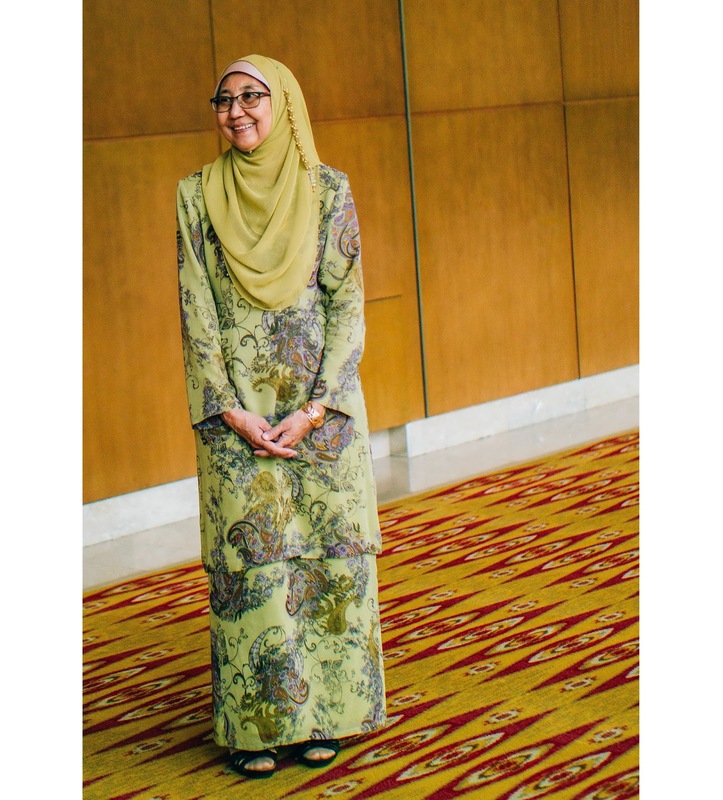 My mom wore this pretty green baju kurung with a beautiful matching scarf. Unlike my traditional loose cut (oops, I mean her traditional loose cut), this green one is the more modern version with a slight narrower waist. Rina's outfit is coming up so keep your eyes peeled for that! 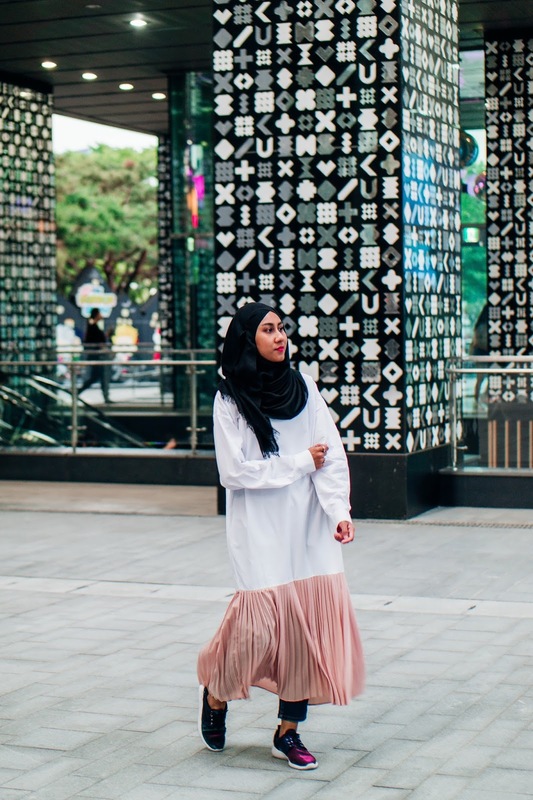 I keep talking about wanting to wear a two-piece baju kurung to share on this blog, so finally here is oneee. 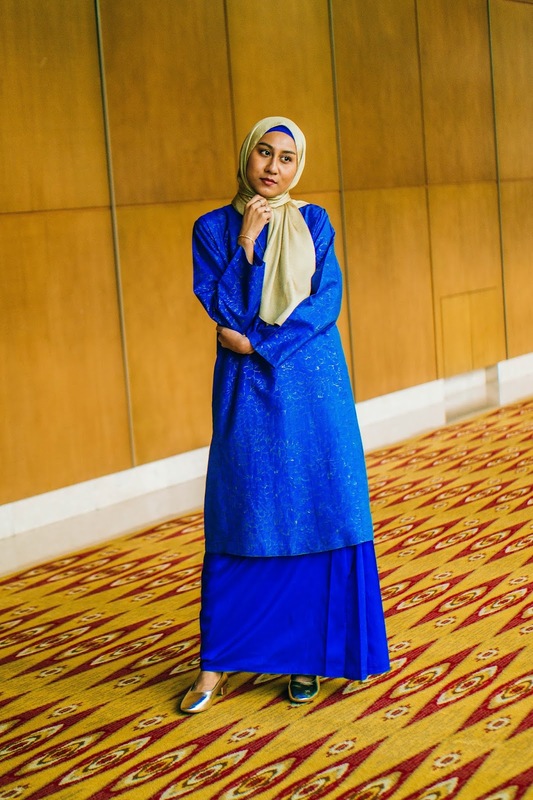 This electric blue baju kurung actually belongs to my mother, which I successfully pinched from her right before I got engaged to Shah; I remember saying I wanted to wear it for my engagement party eight years ago and being told off by my mom to "Stop talking nonsense, Liyana!" 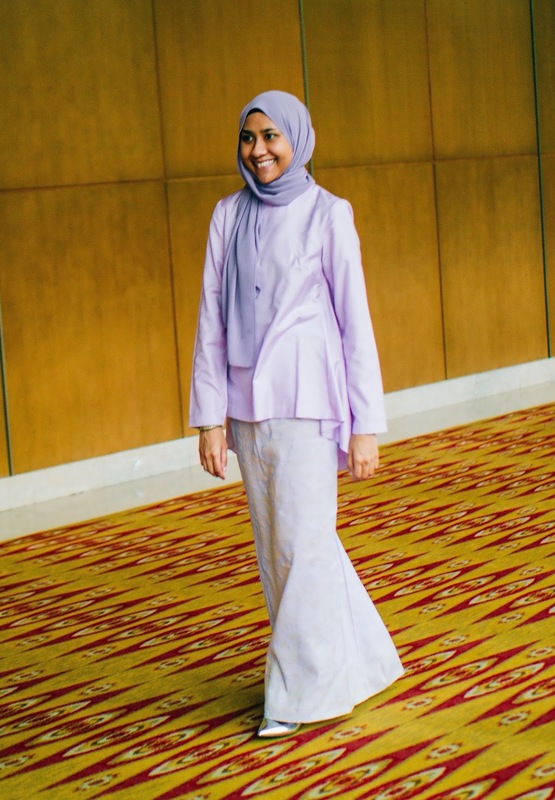 Well, surprise surprise, mother knows best because the purple modern baju kurung I tailor-made afterwards for that special day was wayyy prettier and more appropriate (and my mom LOVED it). 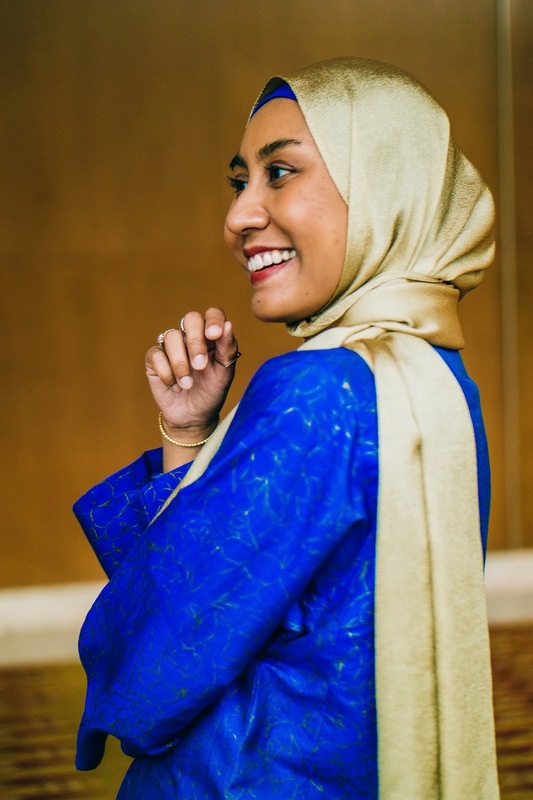 PS: Malay future brides in Malaysia usually host the engagement party before the weddings (that's right, it's typically plural) where the future groom's mother put the ring on to seal the engagement deal instead of the boyfriend! 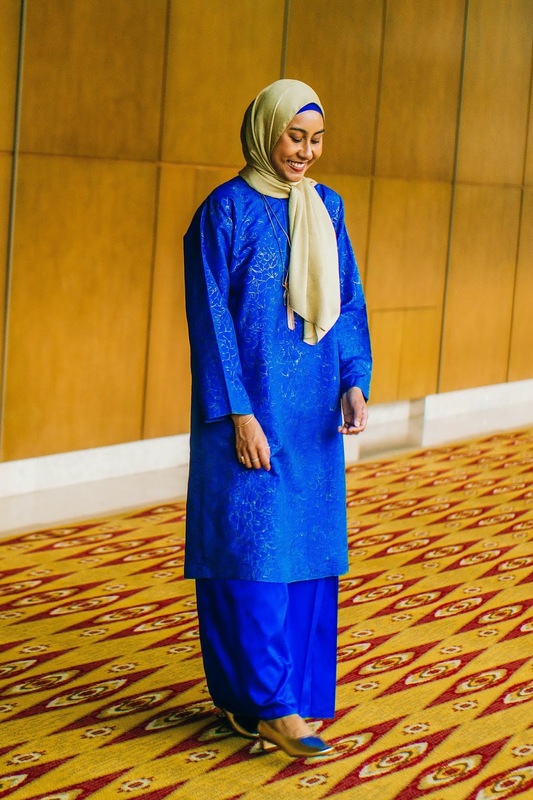 It must be noted that this blue baju kurung in particular is slightly more voluminous than what we Malaysians normally would wear; my other pairs of old baju kurung were narrower than this, too. My mom has always been pretty slim as well so I'm not sure what happened with the tailoring, to be honest. It doesn't bother me though; I actually like the fitting, plus I'm just uhbsessed with the thai silk material. 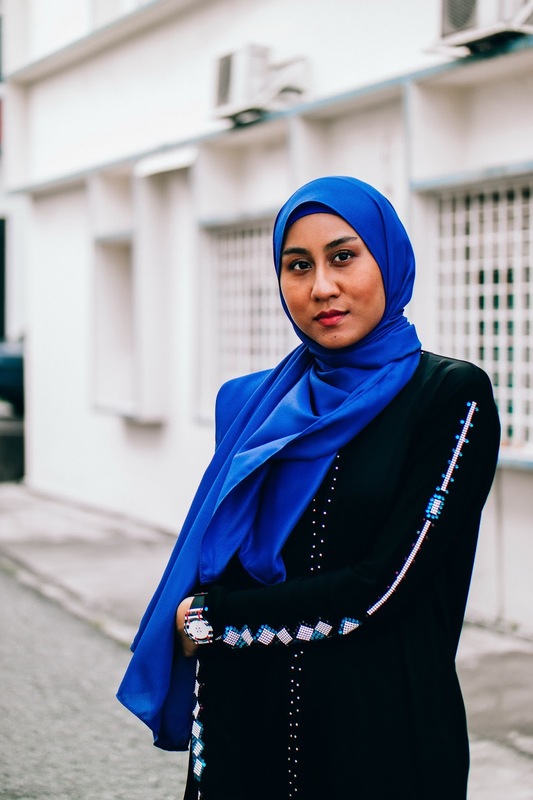 I've always loved electric blue but wearing this old thayng again made me realised how far back my love for the colour dated! 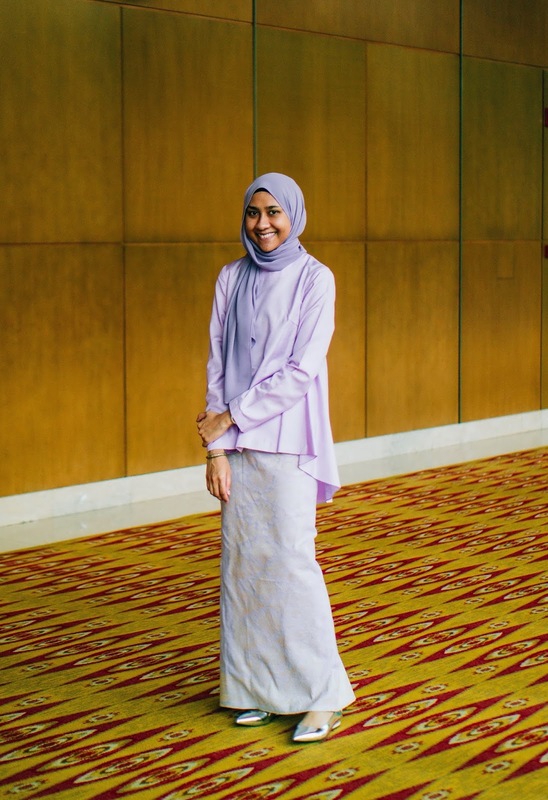 My mom saw me in this outfit last weekend and was all, "Wait a minute, I recognised that baju kurung!" 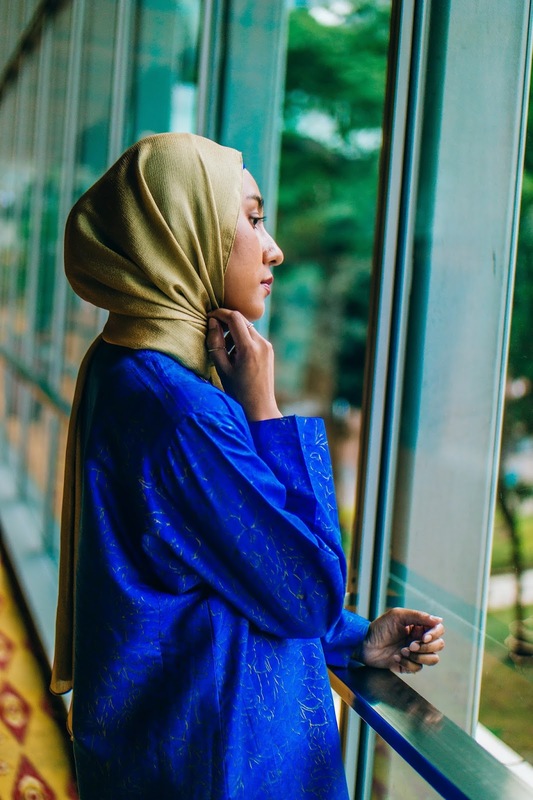 Nowadays women of all ages in Malaysia turn to the more stylish modern baju kurung that cinches in oh-so-slightly at the waist, which generally flatters more than the shapeless traditional version. 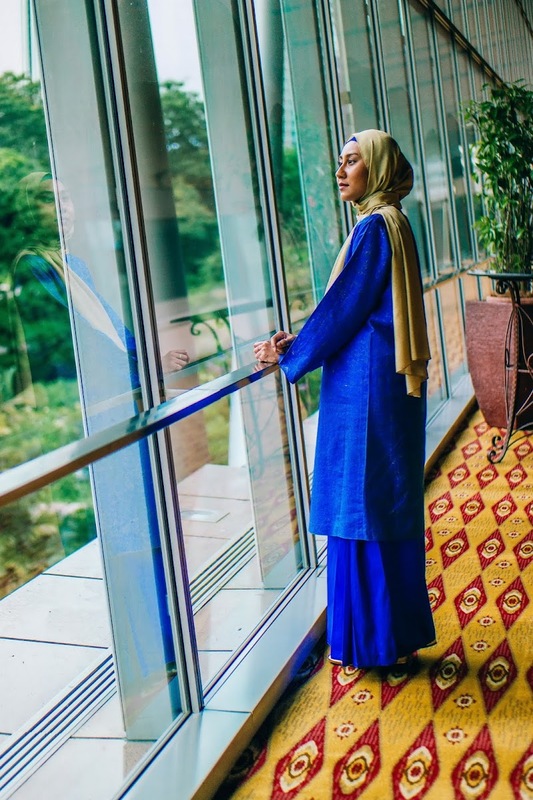 Sure, the loose-cut old-school baju kurung might not have the most flattering shape but the fact that it's a surviving piece of Malaysia's history makes it real special, I think! 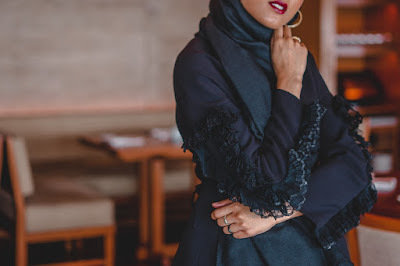 Nevermind that the bunching and ballooning up of the extra fabric makes it appear as if I have a perpetual food bump (which I do, especially during the one-month celebration of Eid!) or even pregnant (which I am definitely not)...I'm still going to wear it, guys. 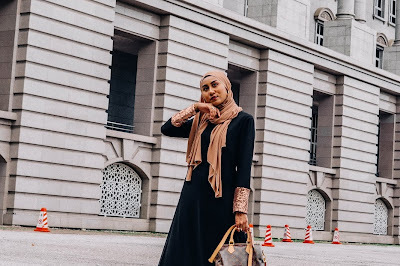 I wanted to bring out the gold threads in the top part of the baju kurung so I accessorised with the gold block heels that I wore on Eid this year and the greenish gold scarf I wore during last year's Eid. 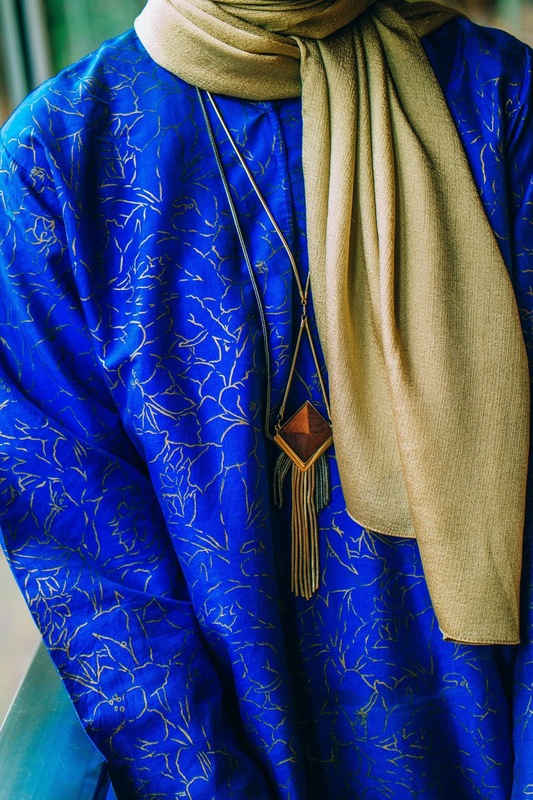 Even with the strong bold hues I had on, oddly I felt a little bare, which was why I added the long necklace I got last year but never knew when to wear. 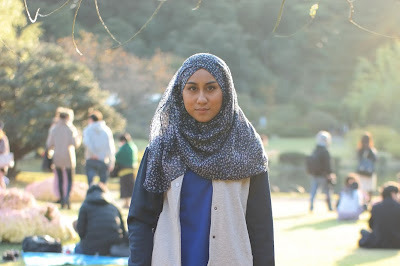 It accidentally stayed hidden underneath my scarf most of the times, but I felt like it really completed my attire! Seoul is a real shopping haven, especially for someone with a small budget like me. So doesn't it not make sense that I managed to bring back only two additions to my closet? I mean, two measly things, can you believe it? If you had asked me prior to my trip, "Would you bring back only two things from your Seoul shopping excursions? ", I'd have answered, "Haha when cats fly!" PS: I really like cats, see previous Seoul cat cafe post! There really isn't a long explanation for it other than I didn't see many things that I felt I absolutely must bring back home (again, surprisingly, considering how many things I saw in Seoul). I had never owned anything like it. The top part is made of a shirt-like material but unlike my white shirts, this material doesn't crease as much. LOVES IT. 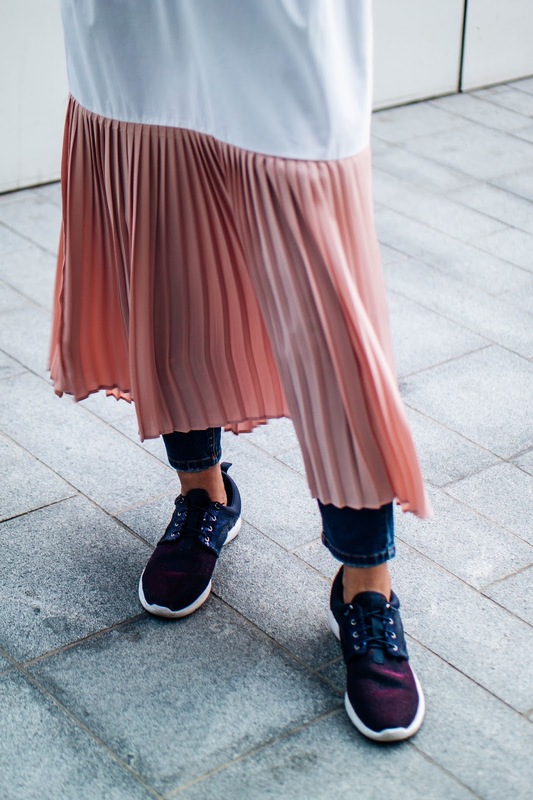 And the salmon-pink pleats? Simply adorable — hearts all around! Or, I guess I should say "affordorability"? It costs less than RM 100, guys. That's less than 25 USD. For its quality = total bargainnn. It's a little short for me so this was the perfect opportunity to get in on some of the "dress over jeans" action. 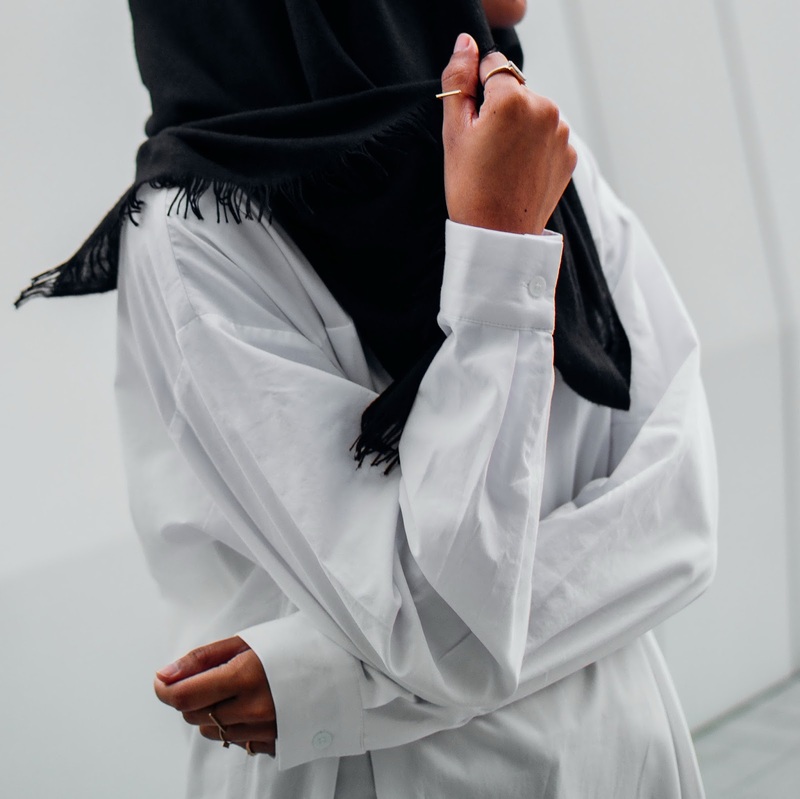 I have to say, for a hijabi like myself, this trend is super welcomed and PERFECT and I hope this styling trick will forever be acceptable in any city's street-style scene! 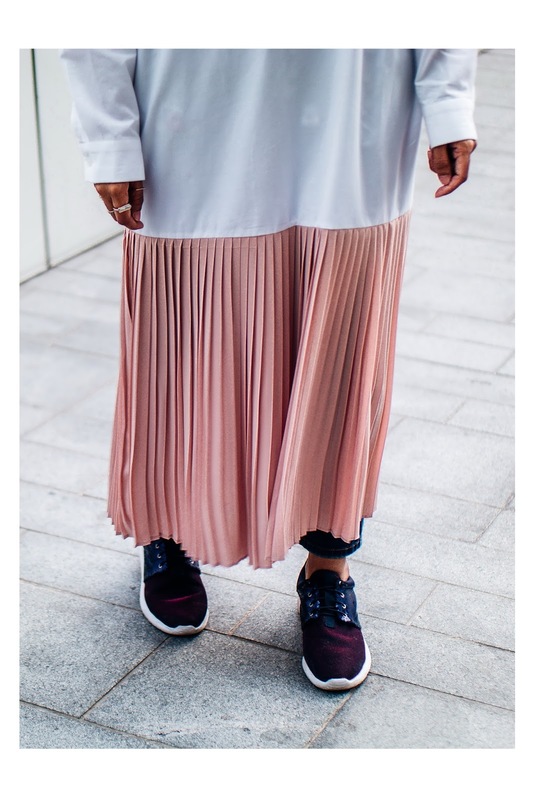 Also, guys, MILLENNIAL PINK, how in tune am I with trends OMG. I bought this dress in one of the many shopping malls in Dongdaemun named aPM Place. It's actually a wholesale shopping mall but unlike the other wholesale malls in Dongdaemun (there are plenty! ), the stores in aPM Place lets you buy just one piece of whatever you want. If I were business-savvy and stuff, I'd definitely be lugging a whole lot more from this mall and I'd be making big bucks, I tell yah; the stuffs there are SO GOOD, and super affordable. So here's one tip for shopping in Dongdaemun in Seoul: find out if the mall you're going into is for wholesale shopping and if it is, if the stores in there will let you buy one piece and only one piece of whatever tickles your fancy there! Oh, another tip: No trying out clothes in most malls there (I wasn't even allowed to try on a jacket on top of what I already had on, pish posh) so, GOOD LUCK.